As a group, we truly draw our strength from our numbers. Our membership of more than 3,100 worldwide has provided more than $65 million since the George Eastman Circle was created in 2007. The impact we have made, year after year, is simply remarkable. Since the inception of our program, we have helped make a significant difference in the lives of students, faculty, patients, and in the local and global communities because so many members continue to renew their memberships. Many of our members are renewing their commitments to the University right now, making this a particularly important time of year for the George Eastman Circle. For the George Eastman Circle to continue to provide ongoing philanthropic leadership, staying together and maintaining our numbers is just as important as expanding. I encourage you to think about where you designate your support and why it is important to you, and if you have not already, kindly renew your membership or submit your George Eastman Circle payment. One out of three George Eastman Circle members now use our auto-pay option. If you have an interest in this new, convenient method, please contact the team to initiate this easy method of keeping your membership current. To all of you—continuing and new members—thank you for your dedication. Staying together and working together will enable us to make an extraordinary difference in many lives, for many years to come. 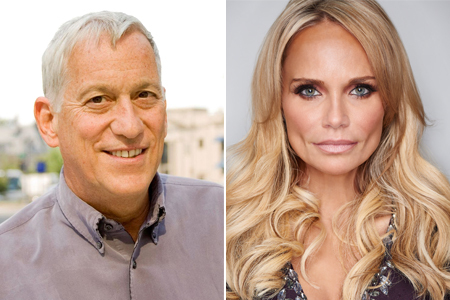 Best-selling author Walter Isaacson, along with Emmy and Tony Award-winner Kristin Chenoweth, will be featured guests at Meliora Weekend 2015. The University’s annual celebration of class reunions, family weekend, and homecoming will take place October 8 through October 11. Isaacson will provide a keynote address on Saturday, October 10 at 11 a.m. in Kodak Hall at Eastman Theatre. Isaacson is the former chairman and CEO of CNN and the former managing editor of TIME magazine. His new book, The Inventors: How a Group of Hackers, Geniuses, and Geeks Created the Digital Revolution, is a biographical tale of the people who invented the computer, Internet, and the other great innovations of our time. His other best-selling books include Steve Jobs; Einstein: His Life and Universe; Benjamin Franklin: An American Life; and Kissinger: A Biography. He is also co-author of The Wise Men: Six Friends and the World They Made. In 2012, Isaacson was selected as one of the 100 most influential people in the world by TIME magazine. On Friday evening, October 9, Chenoweth will perform at Kodak Hall. All George Eastman Circle members will have the chance to buy tickets before they go on sale to the general public, as well as attend an exclusive pre-concert reception at the Memorial Art Gallery. Earning standing ovations from sold-out crowds in Carnegie Hall, Royal Albert Hall, Sydney Opera House, and other venues around the world, Chenoweth has built a career that spans film, television, and vocal recordings. She won a Tony Award for her performance in You’re A Good Man, Charlie Brown, and her movie appearances include roles in The Pink Panther, Deck the Halls, Bewitched, Running with Scissors, and The Boy Next Door. On television, Chenoweth won an Emmy Award for her role in Pushing Daisies and has also appeared on Glee, The West Wing, and several PBS specials. Her concert performanceKristin Chenoweth: Coming Home was released as a CD and DVD in 2014. Please note that there will not be a ticket lottery for the keynote address this year. For more information about the Meliora Weekend registration process follow your member level:Associate and Member; Fellow, Benefactor, Patron, and Founder. All of our George Eastman Circle members have wonderful stories to share. We are pleased to feature this story from a member who supports the School of Arts & Sciences and is an alumnus and a staff member of the University, as well as a grateful patient of the Wilmot Cancer Institute. 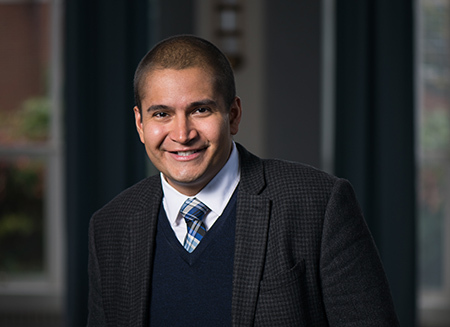 Brooklyn native Jason Buitrago ’07, ’14W (MS) loved growing up in New York City, but when it came time for college, he wanted something different. Among the first generation of his family to pursue a bachelor’s degree, he looked beyond the city for the quintessential college environment: ivy-covered brick buildings, a campus that engendered a sense of community, and a curriculum that allowed him to choose his own courses. In short, he found the University of Rochester. With a financial aid package to boot, the University checked all his boxes, and Jason enrolled. As a student, he plunged into campus life, becoming a resident advisor, tour guide for Admissions, editor of the Campus Times, and president of his senior class among other activities. 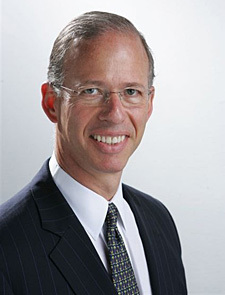 In his remarks at his 2007 commencement, he urged his fellow classmates to stay connected to the University of Rochester after graduation, which he did in numerous ways, including by becoming a member of the George Eastman Circle. Jason had such a love of higher education that after graduation, he stayed on as a full-time staff member and a part-time graduate student. With his bachelor’s degree in math and experience as a financial aid work-study student, he joined the staff of the college’s Financial Aid Office. At the same time, he pursued a master’s degree in higher education at the Warner School. Even while working and going to grad school, Jason still found time to volunteer as co-chair of the Class of 2007’s record-setting fifth-year reunion gift campaign in 2012. Now a cancer survivor, Jason volunteers to help other patients navigate their experiences with this disease. He is grateful to the University on so many levels. “It’s come full circle for me,” he said. “This place not only saw me become an adult, it also allowed me to live.” Through his career efforts, current doctoral studies, volunteering, and generosity as a George Eastman Circle member, Jason hopes to continue to help others find everything they need at the University of Rochester. Gifts not only helped complete the new eight-story hospital, but they also supported the research of physicians like asthma expert Jill Halterman, M.D., who launched a five-year study, in partnership with the Rochester City School District, to help urban teens keep their asthma symptoms in check. Your support has enabled Eastman to provide tuition assistance to the most talented students and give them opportunities to share and hone their artistry in special performances, such as the Eastern Trombone Workshop in Washington, D.C., across the country. Rochester has had another year of All-Americans, deep tournament runs, and incredible accomplishments—the softball team reached the NCAA Division III College World Series for the first time in University history—with the help of your designations to the athletics program and support of our scholar athletes. 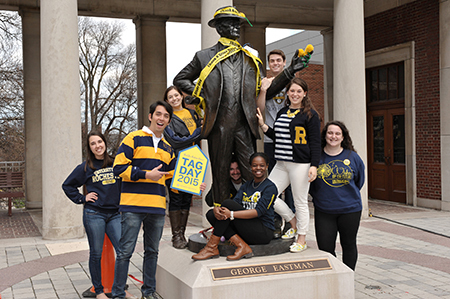 On April 21, the University held its first Day of Giving and Thank A Giver (TAG) Day. George Eastman Circle members were among the more than 1,000 donors who gave more than $739,000. For TAG Day, more than 550 tags were placed around the River Campus identifying donor-supported items. Students, alumni, and friends celebrated philanthropy at the University through various activities, such as photos and social media posts. See how, on this special web page. Below are members who have made significant Campaign gifts in addition to their membership commitments or have exemplified Meliora in the areas of academia, health care, arts and culture, and/or research. 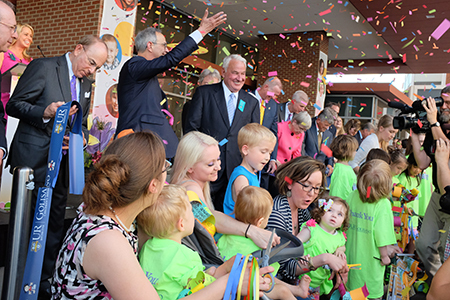 After years of planning, tireless efforts, and the dedicated support from a community of thousands, a ceremony was held on May 27 to celebrate the dedication of the new, and long-awaited, Golisano Children’s Hospital. The new space, set to open in July, will serve 74,000 children and families across the Finger Lakes Region—a resource made possible in part by the gift designations of many George Eastman Circle members. You can see highlights from an incredibly moving day in a special dedication video. Golisano Children’s Hospital’s Ganatra Family Atrium will immediately help sick children and their families feel comfortable with its abundance of natural light and color. The atrium was named to honor the Ganatra Family as part of a $3 million commitment by Charter Member and Trustee Richard (Rick) T. Aab. Rick and Tansukh Ganatra have been close friends and business partners for three decades. You can read more about Rick’s gift in the official press release. Grateful to the University for the life they have today, Charter Members Rita and Lawrence Chessin ’58 have made a $1.5 million commitment to establish the Lawrence N. Chessin, M.D. ’58 and Rita R. Chessin Professorship in Infectious Diseases. The Chessin Professorship will be held by the division chief of infectious diseases, an area of UR Medicine that combats the deadly microbes behind viral infections such as HIV, HPV, influenza, and dengue. You can read more about the Chessins’ gift in the official press release. Soon the patron services area just off the Roger B. Friedlander Lobby of Rush Rhees Library will have a name of its own:Evans Lam Square. The name recognizes the generosity of Charter Members Susanna and Trustee Evans Lam ’83, ’84S (MBA), who made a $1 million commitment to establish theEvans and Susanna Lam Library Revitalization Fund. Lam Square will be a state-of-the-art center for library users to conduct research, collaborate on projects, explore new technology, and unwind. You can read more about the Lams’ gift in the official press release. Breast cancer is a disease with which the Bucci family is all too familiar. To help fight it, and honor friends and family who have battled other cancers, Joseph G. and Elaine Bucci have made a $1 million commitment to create the Bucci Family Breast Cancer Research Fund at UR Medicine’s Wilmot Cancer Institute. You can read more about the Bucci family and their gift in the official press release. On May 20, a formal ceremony installed George Eastman Circle member James V. Aquavella, M.D., and Krystel R. Huxlin, Ph.D., as the Catherine E. Aquavella Distinguished Professor in Ophthalmology and James V. Aquavella, M.D. Professor in Ophthalmology, respectively. Aquavella is serving as the Distinguished Professor in Ophthalmology in an honorary capacity. The ceremony recognized Aquavella’s generosity as well as his distinguished career as a renowned corneal surgeon. Also highly distinguished, Huxlin, the director of research at the David and Ilene Flaum Eye Institute, was honored alongside Aquavella for her leadership in ophthalmology. Both professorships were established in 2013 by a $4 million commitment by Aquavella, which he made in memory of his late wife, Kay. You can read more about the installation ceremony in the May issue of Fast Forward. One of the ways we’re able to thank you is to extend invitations to various regional gatherings, dinners, and University programs. For more information or to register for any of the following events, please contact the Office of Donor Relations at 800-281-2055. All George Eastman Circle members are invited to stop by our JazzFest Hospitality Suite, located on the second floor of the Eastman School of Music. Tickets for the dinner are $35 per person and can be purchased online. To purchase tickets to the concert, please contact the Boston Symphony Box Office at 1-888-266-1200.